Harmet’s rise to become Estonia’s biggest wooden houses producer has been impressive. The company’s sale profit has increased more than three times during the past three years. Additionally, quite some profit has been made, reaching 5 million euros last year, states the annual report of Harmet. Board of Harmet confirms that the rise in turnover was mainly achieved due to long term co-operation contracts with strong customers and that has enabled to better plan the production and grow efficiency. The company’s main activities last year included engineering, production and erection of modular houses and modular on-site facilities. Production units are located in Saue, Pärnu and Tutermaa. Most of the produce went to Scandinavian market, about 75% of turnover came from the Swedish market and 20% from Finland. Harmet’ s main goal for this year is to improve efficiency. A new factory will open in Kumna (the company’ s main office will re-locate there as well), Harku municipality in July. The factory has been planned especially to produce large modules in big volumes. A new factory will open this summer in Kumna, near Keila, which makes Harmet the biggest wooden houses producer in Estonia. 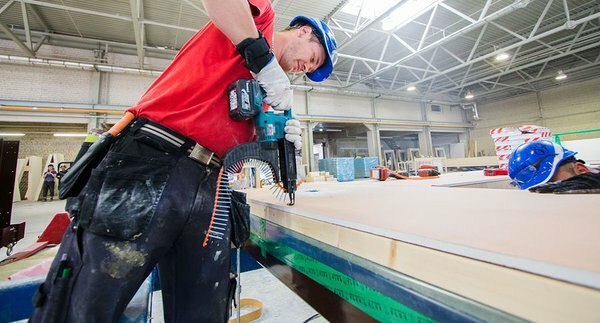 Expanding production requires hundreds of new employees and therefore Harmet is actively looking for qualified engineers, specialists of heating and ventilation, operators of CNC wood router, construction workers-carpenters. Work specifics will change due to opening of the new factory, that adds the necessity for different kind of employees and young people who have just graduated school are very welcome. “It is very difficult to find top specialists in Estonia today,” say Chairman of the Board Toomas Kalev and Personnel Manager Maret Pulk and add that companies have to try harder and harder to motivate employees. Harmet has opened their own training centre for that reason, which enables to learn about occupational safety and work specifics before starting work. Effort is also put into making sure that all employees would have safe and up to date working places. Fair payroll system is also very important in order to secure fair pay according to work that has been done. For that Harmet has invested into new economics software that enables to measure each person’ s contribution individually, something that has been difficult to observe in case of too many employees. New people are searched for through personnel cpompanies and headhunting and Harmet has through a state supported program also recruited employees from Ukraine. “But it is great that especially young people take interest in our new technologies and production lines. We co-operate closely with Pärnumaa Vocational Education Centre and Tallinn Construction School and about 10 students from each school can come to us for their work practice each year. Most of them stay on with a full time job with us,” notes Maret Pulk. With Pärnumaa Vocational Education Centre Harmet has a special program which means co-operation between the school, employer and student in order to train future specialists that Harmet needs. Harmet OÜ was established in 1992 with production of metal products, which makes up only a few percentages of the company’ s turnover today. The new factory will bring along a big increase in production of wooden elements and they also plan to liven up the metal works. Starting the fourth factory besides Saue, Pärnu and Tutermaa will make Harmet the biggest producer of wooden houses in Estonia, who will employ an additional 200 people besides the current 450 employees. The company expects specialists such as qualified engineers, specialists of heating and ventilation, operators of CNC wood router, construction workers-carpenters, managers of production lines. The factory with size of 26 000 m2 opens in July. The main market of Harmet is Scandinavia and Nordic countries and target group bigger construction companies and real-estate developers. Also rental companies that engage in renting on-site facilities to construction companies and renting temporary kindergartens and school facilities to local municipalities. Installing the products across Europe is operated by Harmet’ s subsidiary Harmet Modular Building and more complicated special projects are dealt by subsidiary Harmet Constructions. Also, the house producer has branches in Finland, Norway and Sweden.